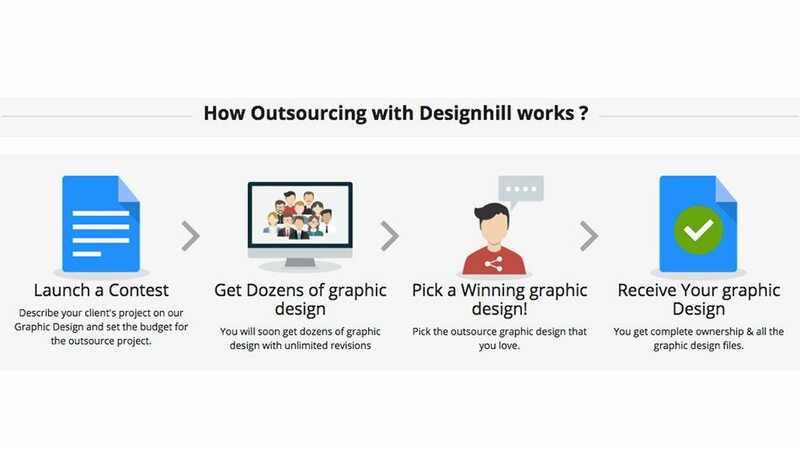 How To Outsource Design Projects At Designhill? Most traditional agency settings including web development firms, ad agencies, design studios and brand management firms are celebrated for their zero-hierarchy culture. Their passionate and excited approach to graphic designs. Their high level of energy and curiosity when it comes to servicing their clients. In almost all such settings, constant change is in the air and exploration is often the name of the game. 74% agencies are forced to turn away clients as their designers are often overworked. 63% agencies believed that it is extremely difficult to a professional for each design category like logo design, website design, packaging design, custom t-shirt design, etc. For 54% agencies, presenting their clients with multiple design options remains the biggest challenge. Providing clients with multiple revisions and changes remains a big challenge for 12% agencies. With these stats in hand, it’s not too difficult to understand why outsourcing remains so important for such traditional agency settings. Outsourcing helps agencies reduce their overhead expenses by 10-15%. Diversity drives the outsourcing machine making it possible for design agencies to the increase the design choices for their clients. In addition, space can be a constraint for agencies looking to thrive the competition. Outsourcing design projects eliminates that worry. Outsourcing graphic design projects at Designhill is simple and easy. 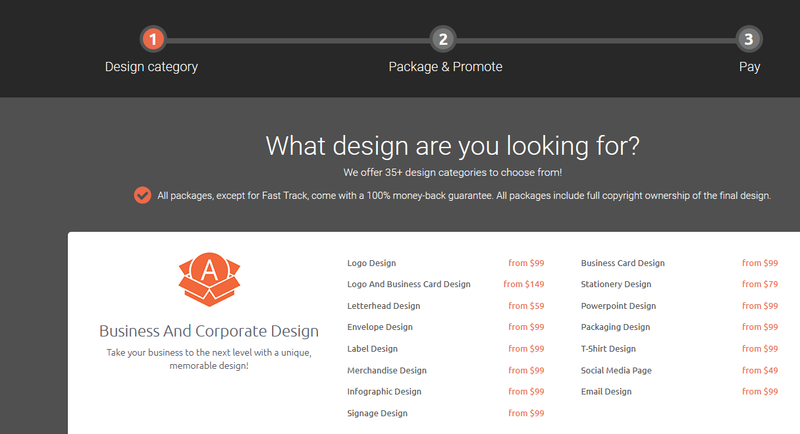 All it takes is 4 simple steps to outsource your projects to the creative crowd at Designhill. 1. 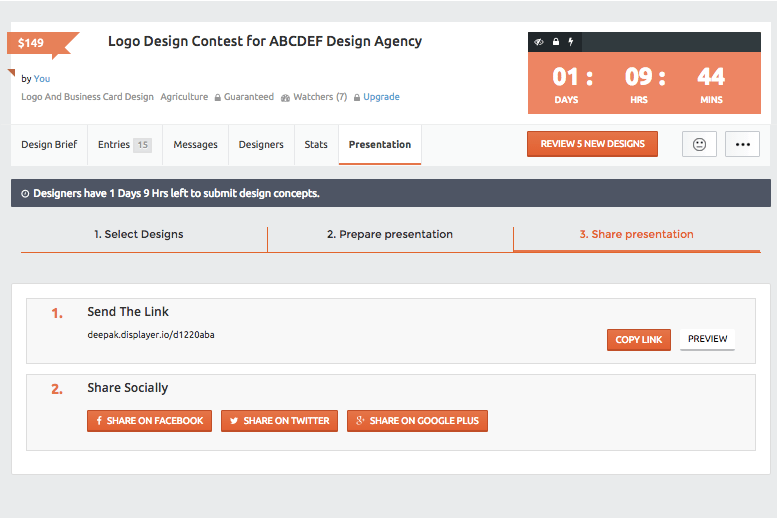 Posting a Design Brief – Visit Designhill.com and click on ‘Launch Contest’ button. 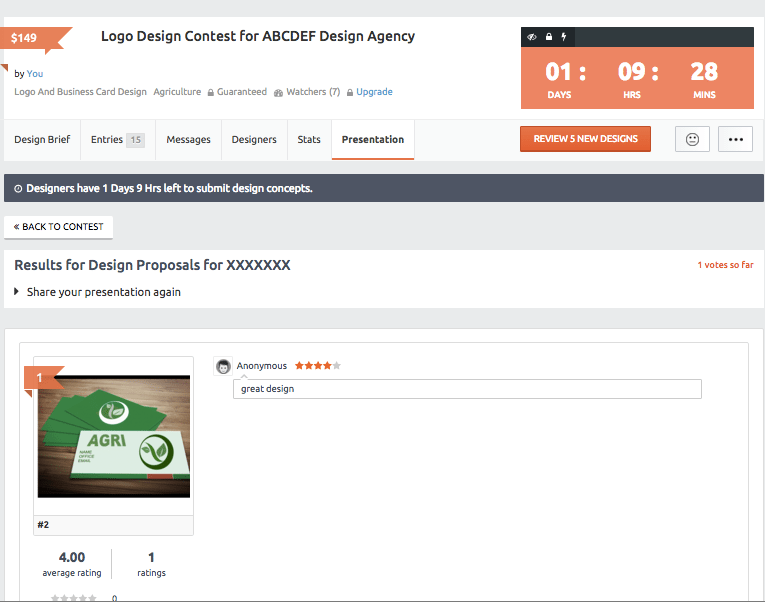 Once, you click on ‘Launch Contest’, you’ll need to choose the category of design you wish to get created for your client. 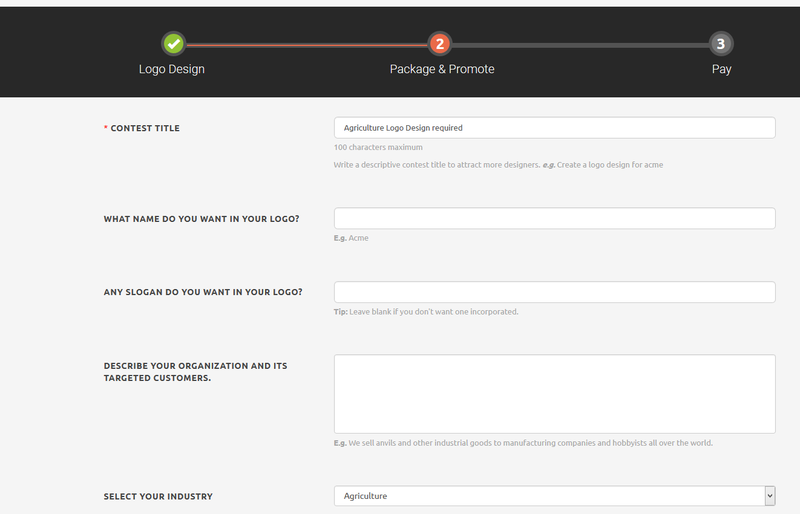 After you select the design category, you’ll be required to choose the design style, colors and fonts for your design. This is an option step and you may choose to skip these steps. 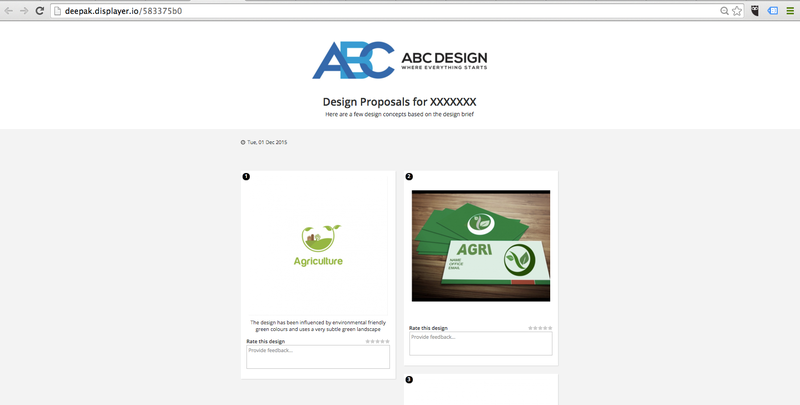 Now, fill the ‘Design Brief’ form and describe your client’s project. Then, select a price package as per your budget and specifications for your outsource project. Once, you select a package and pay for it. 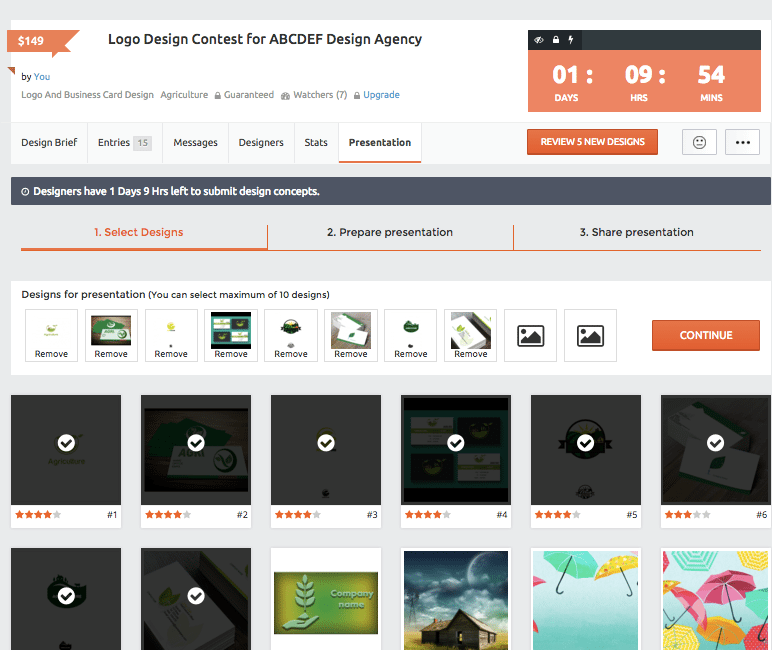 Your design project will go live and designers will start creating designs in response to your contest. 2. Create a White Label Presentation – Rebrand your outsourced designs as your own and share with your clients using our online white labelled web portal ‘DISPLAYER.IO’. You will be able to share designs with your clients via the above white labelled online web portal, which is hosted by Designhill. This portal is not connected with or references to Designhill. 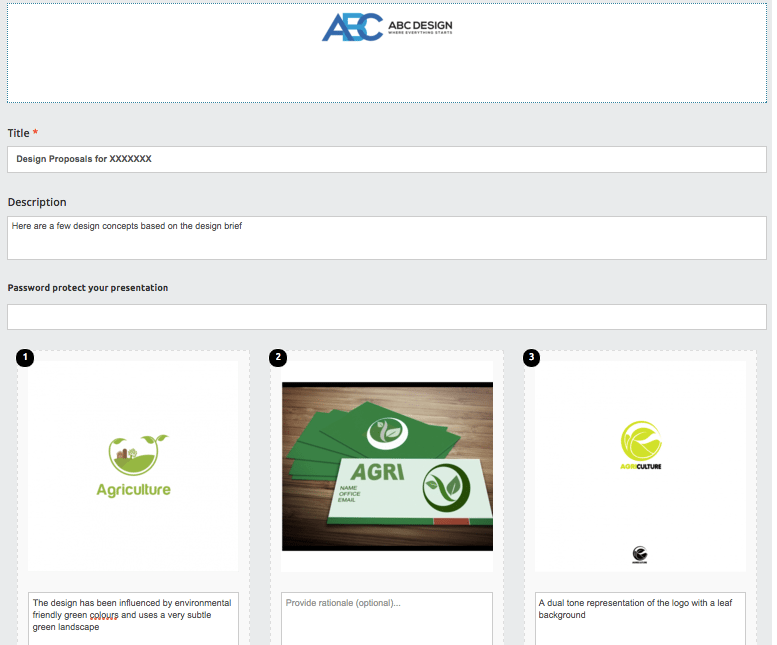 Click on the Presentation Tab and select up to 10 designs per presentation that you want to showcase to your clients. Once you have selected your preferred designs, you can customize your presentation by adding your company logo, title, and descriptions for the presentation and for individual designs. * You can even make the presentations password protected. Once you presentation is set up, you can then share the ‘unique presentation url’ with your clients. This will help you maintain secrecy and will allow you to showcase your designs on a separate domain. In the below presentation the unique presentation URL is ‘Deepak.displayer.io/d1220aba’. You can share your unique URL with your clients. 3. 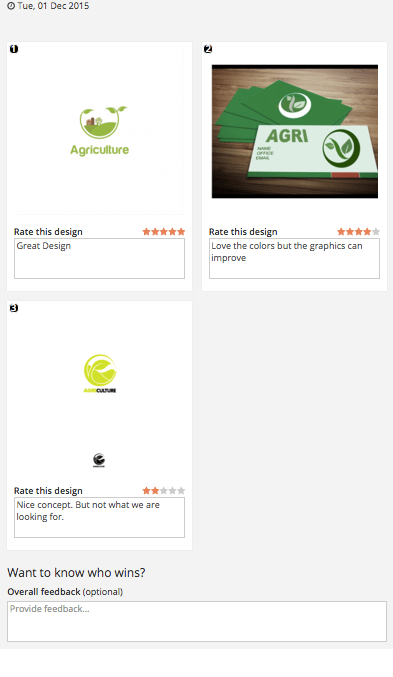 Share & Feedback – Easily share selected designs with your clients via our White Label Presentation tool which will let your clients give star ratings and leave feedback to designs. 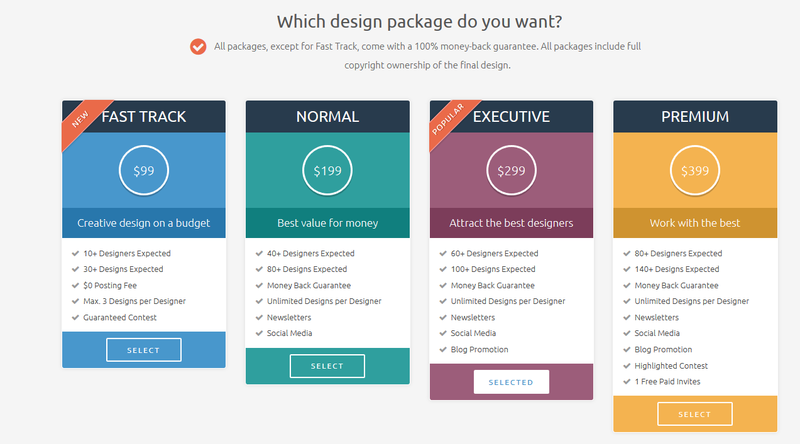 You get unlimited revisions on the designs received. After clicking ‘Continue’, you’ll be taken to a page where you’ll find the link to your presentation. Click the Copy link button to copy the link to paste it into an email or share it on social media sites. Once your clients visit the presentation URL, they will see a White Label presentation complete with your logo, description and designs. Clients can rate the designs and give you feedback. 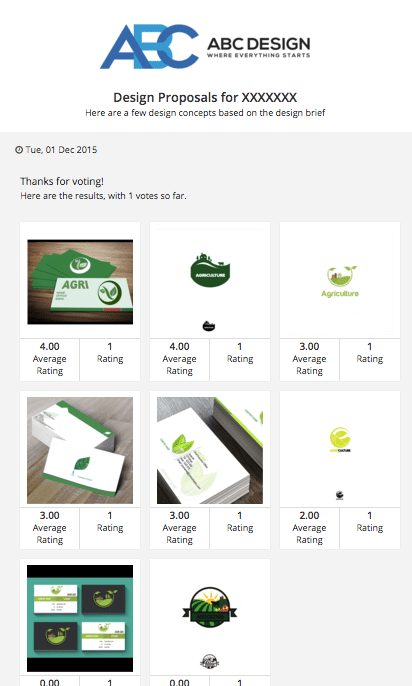 Different members in the client’s team can independently give their feedback and then see how everyone has voted on the designs. You can instantly see the results of the voting and feedback on your contest screen. 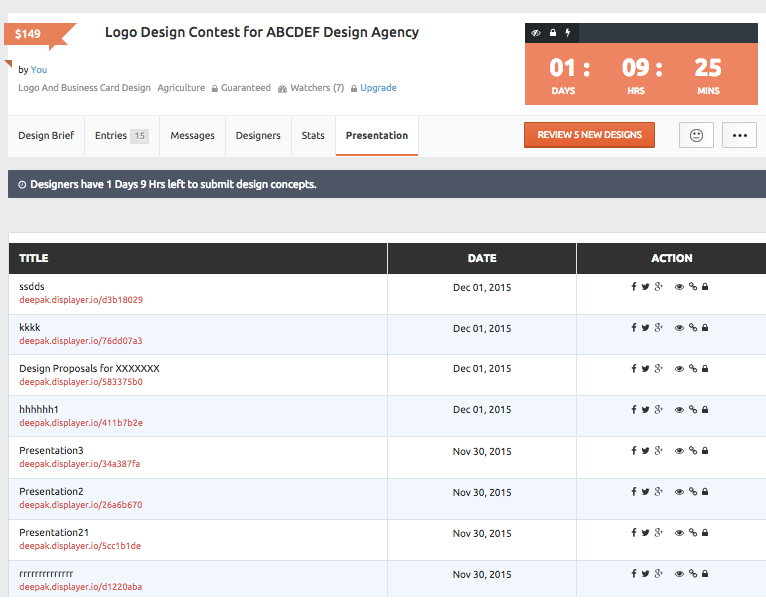 Using this feedback you can ask for further revisions and changes from the participating designers in your contest. You can create as many presentations as you want. 4. Pick a Winning Design – At this point, you’ve already feedback and rating for design submissions from your client. Now, basis your client’s feedback, choose the best design and award a winner for your project and download the files immediately. Ask yourself, what if a long-time client of yours comes to you and asks for something that you may not have time to complete or lack the necessary resource. Would you simply turn away your client and jeopardize the otherwise pleasant relationship with them that you have worked so hard to build with them? Of course not! Outsource the project at Designhill and to fulfill the needs of your client. Previous Previous post: [Video] Why You Need Professional Graphic Designer For Your Business? Next Next post: Why Outsourcing is the Biggest Growth Hack for 2016?